A word from the authorities CANTON OF GENEVA Above and beyond the simple number of participants - more than eighteen thousand - what is also impressive is the number of different nationalities represented on the start line. One hundred and thirteen! The Harmony Geneva Marathon for Unicef reflects perfectly the international nature of Geneva and the diversity of its population. The event and its eight race formats traverse 13 different communes and features all facets of Geneva from the town centre to the countryside. Geneva is proud and honoured to welcome you for the event. On behalf of the Canton, I wish all the athletes, organisers, volunteers and partners my best wishes for the event. Sport is an opportunity to share and live together and unite society in the process. CITY OF GENEVA This year marks the 30th anniversary of the Convention on the rights of children, and rather appropriately the 10th year of collaboration between the Harmony Geneva Marathon and Unicef who work to protect the rights of children around the globe. Thus, the participation of children in this yearâ&#x20AC;&#x2122;s event is of particular importance, and marked by the creation of the Parents-Kids race of 1km on the Saturday. A great initiative that matches the City of Genevaâ&#x20AC;&#x2122;s desire to link youth participation in sport to the development of our city. Sport will once again be the vector of many important life lessons on the 11th and 12th of May in Geneva, and the city of Geneva will be better for it. I want to thank all of you who have decided to take part and take on your own challenge, and wish you all a great race. A word from our partners HARMONY It is with great pleasure and passion that Harmony continues its partnership as title sponsor of the Harmony Geneva Marathon for Unicef for the 6th consecutive year. Our mission as a company is to promote physical activity and well being for all and to support all athletes in the achievement of their goals. This major sporting event in Geneva is an important investment for a local family owned company like ours but it is a reward in and of itself as we see the number of participants increase year on year. Particularly the number of newcomers to the sport who take part in great conditions and with a can-do attitude. We are also delighted to see the creation of the new Parents and Kids race which will help attract some new participants. Our team will also be present at the public training sessions in the lead up to the event in March and April as well as at the Stretching session on the Saturday morning (9am) and at the Family Zumba (3:15pm, Jardin Anglais) in the afternoon. As always, our team will also be present on the start lines of each race to lead you in your warm up. Finally, a new addition on our stand in the Marathon Village this year is a pacing bracelet for runners to help them reach their objective on their race. See you there! UNICEF Dear athletes, for 60 years UNICEF Switzerland and Liechtenstein has been working for the rights of children and young people all over the world who are in severe need. Thirty years ago, the UN Convention on the Rights of the Child came into force. Today, UNICEF is proud to be a charity partner for the 10th time at this spectacular event in Geneva. Three anniversary celebrations, all in the name of children’s rights. Without you, our work for children’s rights would not be possible. The Harmony Geneva Marathon for UNICEF is an ideal opportunity for you to show your solidarity for the world’s most vulnerable children through the medium of sport. You can help to support UNICEF as soon as you register for the Harmony Geneva Marathon for Unicef. You can also open your own fundraising page and encourage your nearest and dearest to sponsor your run for UNICEF. This year, your donations will once again be used to fund water pumps. There are still 884 million people around the world who are drinking polluted water; but clean water is the foundation of life. In small but crucial steps we are changing this situation together for children at risk: Since this partnership began, we have raised over 350,000 Swiss francs and been able to buy a total of 850 water pumps. Our goal for 2019 is to install a total of 1,000 hydraulic pumps. Please help us to do this for the children! On behalf of UNICEF Switzerland and Liechtenstein, I would like to thank you in advance, dear runner, for your involvement and commitment, and wish you every success on the day. BY FOOT OR BY BIKE A great way to get around before, during and after the event. A bike park will be available near the event village for bikes to be stored. PUBLIC TRANSPORT AROUND GENEVA To get to the start line in Chêne-Bourg, take tram 12 and get off at ‘Place Favre’ located 200 metres from the start line. 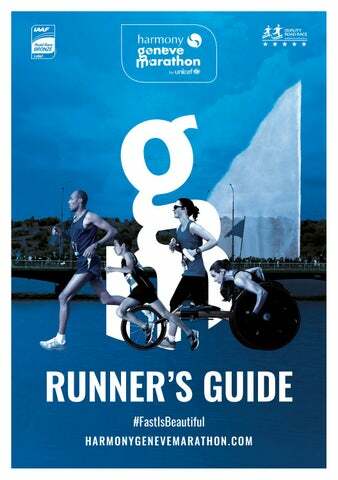 Runners are offered free public transport in Geneva (Zone 10 only) on the day of their race. The Harmony Geneva Marathon for Unicef works in partnership with Geneva Public Transport (TPG) – Unireso – to ensure that transport in and around the city is as easy and enjoyable as possible for all participants. Runners must download or print their transport card (sent by email with the bib collection coupon). Transport cards are nominative and runners must carry a valid ID document as well as their transport card in case of inspection. CAR PARKS We vividly encourage you to carpool if possible to minimise the number of cars on the road and in the city. Free Park & Ride: Free parking is offered to runners on Saturday 11th May and Sunday 12th May in the following Park & Rides: Sous Moulin (from Saturday 6am to Sunday 10pm), Genève Plage and Etoile (Saturday and Sunday from 6am to 6pm). Please note that for Geneva Plage parking, the quays will be closed on Sunday 12th May from 8.00am to 4.00pm. BIB COLLECTION During the above-mentioned opening hours, upon presentation of your bib collection coupon (sent to you soon by email) and proof of identity (copy accepted) you will be able to collect your bib for your race. No bibs will be sent via post. •	Junior races: the bib must be collected by an adult with the bib collection coupon and proof of the child’s identity. •	Relay Marathon: The team captain must collect the envelope containing the team bib, the relay belt and the individual bibs. •	Collecting someone else’s bib: Please ensure you have the bib collection coupon and proof of their identity (a photocopy is valid). After retrieving your bib you will be able to collect your event t-shirt and visit the Marathon Village. RUNNER’S BAGS Participants will be provided with an official bag, which must be used to store personal belongings during the event and dropped off at the start of your race. You will need to slip into the front pocket of the bag, the bag tag attached to your bib. LOST & FOUND Any person with items lost or found, please visit the information point in the Marathon Village. FOOD & DRINK Food trucks providing a range of culinary options and a bar will be situated in the Jardin Anglais from Friday 10th May to Sunday 12th May. OFFICIAL BOUTIQUE The official boutique of the event with t-shirts, caps, and other souvenirs will be located in the Jardin Anglais. Organic refueling stands all along the race… The day of the race, Bio c’ Bon will give all the race runners an energy boost thanks to its organic products made available at stops along the route. ...and fun entertainment at the village. Organic supermarkets in Lausanne, Nyon, Renens and Geneve Augustins.17 Coming soon to Geneve Eaux-Vives! Entertainment In addition to the various partners and exhibitors stands, there will be many activities in the Marathon Village to entertain kids and adults alike: a giant outdoor Zumba session with Harmony, a kids activities area with Generali, the One FM radio bus and loads of prizes to win elsewhere! With the new SMILE CITY days by SIG, discover the sustainable side of the city of Geneva. The SMILE CITY days by SIG are a collection of fun and informative activities for the entire family, including a street art performance, taste testing and a number of presents to be won. FRIDAY 10TH MAY 10am-7pm Kids playground with Generali 10am-7pm A Sweet Bed by Ibis worth 1000 CHF and many other prizes to win with AccorHotels. COMPRESSPORTÂŽ Morning run & breakfast. Meet in front of the flower clock by the Marathon Village for a short run along the shores of Lake Geneva. Stretching with Harmony. Family Zumba Party by Harmony at the podium. Warm up with the Harmony coaches at the start of each race. OFFICIAL WEBSITE Follow the event live on harmonygenevemarathon.com with regular news udpates. FOLLOW A PARTICIPANT Friends and family members can also follow a runner on the official website or event app. They will see your provisional ranking and intermediate times every time you cross a timing mat. Eat a good balanced breakfast to start the day: slow releasing carbs such as wholemeal bread or oats, with a green tea and a glass of water for example. Get dressed: running shoes, clothes and kit that you are used to training in. Attach your bib, which you already collected from the race village, to the front of your t-shirt. Arrive at the start line 20 minutes before the start, and make the most of the time to warm up and de-stress before the race. Don’t over-fuel on the start line, you will have water and energy products on the feed stations. Start at a conservative pace and build your way into the race. Don’t forget to smile, you’ll get your finisher medal soon enough! Building our future health together. Ready, steady, Run for it! Win an exclusive coaching session with Switzerland’s fastest marathon runner, Tadesse Abraham. Volunteers Volunteers play a central role in the organisation of an event and conveying the image of the event to participants and the public. Thanks to you, the thousands of runners registered for the Harmony Geneva Marathon for Unicef will be able to participate in the event in optimal conditions. Discover the various assignments, from bib collection to finish line staff, still available on our website. (Geneva) upon presentation of your bib, you have until 9pm to collect your bag. Start Block: Please respect the time that is written on your bib. If no time is written on your bib please respect the predicted race time entered during your registration. After the finish come and get your picture taken in the dedicated Always zone! Prize Giving: 8.15pm, Jardin Anglais (Top 3 overall). Age category prizes must be collected at the info point. Bag Drop: Place Favre (ChĂŞne-Bourg) between 7pm and 7.45pm Bag Collection / Changing Rooms: Quai Gustave Ador (Geneva) upon presentation of your bib, you have until 10.30pm to collect your bag. Start Block: Please respect the time that is written on your bib. If no time is written on your bib please respect the predicted race time entered during your registration. Participants in the 10km Walking and 10km Nordic Walking will set off after the runners. to achieve your objectives, you will have a number of pace setters taking part in the race. They will be in the 45 minutes, 50 minute, 55 minute and 1 hour start blocks and will be identified by coloured flags with their respective times on them. Feed stations: You will be able to benefit from a feed station at the 5km mark and at the finish line. Bag Drop/Changing Rooms: Place Favre (ChĂŞne-Bourg) between 7am and 8am. your bib. If no time is written on your bib please respect the predicted race time entered during your registration. achieve your objectives we will have pace setters for the following times: 1h30, 1h40, 1h45, 1h50, 2h00, 2h10. They will be in the corresponding start blocks and identifiable by a coloured flag with their respective time on it. bag from Quai General Guisan (Geneva) upon presentation of your bib. You have until 4.45pm to collect your bag. achieve your objectives we will have pace setters for the following times: 3h00, 3h15, 3h30, 3h45, 4h00, 4h15, 4h30 and 5h00. They will be in the corresponding start blocks and identifiable by a coloured flag with their respective time on it. A feed station will be situated just after the finish line. A changing room will be available for all participants in front of the trucks where you will collect your personal belongings after the race. Showers will be available at the College Calvin (See map P16) for all runners on the Sunday. The last runner of each team must return the belt to the organisation team to get the medals for all the team members. Massages will be available in the Marathon Village on Sunday 12th May. The number of masseurs being limited, you may have to wait â&#x20AC;&#x201C; thank you for your patience. Take your first finsher â&#x20AC;&#x153;selfieâ&#x20AC;? right after the finish line! Results will be available online at harmonygenevemarathon.com and on the official app shortly after the end of each race. All runners will receive a link to view their race photos, download their finisher certificate and view the event video. Order your personalised medal plaque with your name, race and result directly from your registration form. These cost CHF9 before the event, CHF12 during the event and CHF12 after the event. Charity MAKE A DONATION TO UNICEF By participating in one of the races of the Harmony Geneva Marathon for Unicef you can help disadvantaged children in collecting donations for each kilometre you run to finance the construction of water pumps in drought-ridden parts of the world. Your sponsors, your family, friends and acquaintances can support you and make a contribution, no matter how small. Participate and register now at www.unicef.ch/GenevaMarathon 850 hydraulic water pumps have been built since 2010 thanks to the donations made to Unicef by our runners. WASTE TREATMENT As an Event Official Supplier, Serbeco will help the Harmony Geneva Marathon for Unicef for its waste management and treatment. NON-SMOKING AREA A non-smoking area will be in effect all around the fountain area within the Marathon Village. FOOD ZONE Our food trucks are committed to using recyclable knives, forks, plates and bowls as well as the Eco Cups. We do everything we can to offer you a sustainable Food Zone, please help us also by recycling your waste in the designated Serbeco bins.